Thermwood Corporation, a leading U.S. based manufacturer of CNC routers, has announced a program to develop a 3D Additive Manufacturing System, capable of making large carbon graphite reinforced composite thermoplastic components. Thermwood’s systems utilizes a “near net shape” approach where a relatively large extruder, mounted to the machine, is used to heat, melt and deposit, or “print”, carbon graphite filled thermoplastic material to quickly create a structure which is almost, but not quite the exact final shape. That structure, when it cools and hardens is then five axis machined to the final net shape. These new systems will be based on Thermwood’s Model 77, semi-enclosed, high wall gantry machine structures, which are currently offered in sizes up to sixty feet long. For the plastic extruder, Thermwood turned to American Kuhne, the preferred provider of engineered solutions for plastic, rubber & silicone extrusion, who developed a custom system, which integrates tightly, both mechanically and electronically, with Thermwood’s CNC machine. This allows not only the machine but also the plastic extruder to be controlled and managed by a central CNC control, insuring smooth integration and increasing both capability and flexibility. With the addition of a second gantry, both the “Additive” and “Subtractive” processes can be performed on the same machine. The second “Subtractive” gantry will be offered as an option. Companies that already have five axis machining capacity and want to work with Additive Manufacturing may only require “Additive” machine capability as they can use existing equipment for the “Subtractive” part of the process. 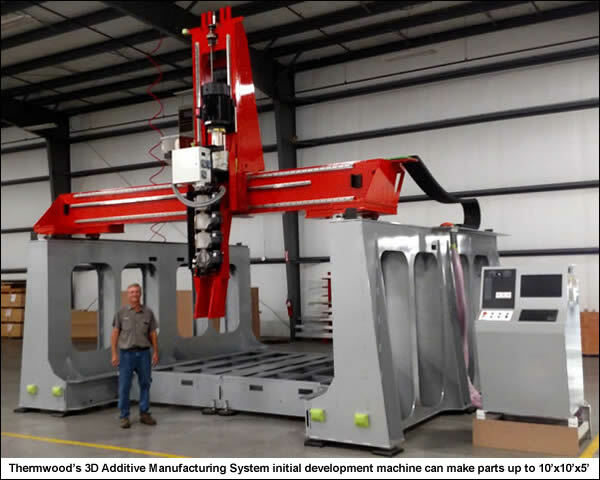 Thermwood’s systems will feature full six axis articulated additive deposition head, allowing it to build layered structures on both a horizontal plane as well as planes canted in any direction up to ninety degrees from horizontal. Management believes this capability will be important as technology advances and more complex structures are required. Thermwood’s initial development machine, which is nearing completion, can make parts up to ten foot by ten foot by five foot high, is equipped with a 20HP, 1 ¾ inch diameter, 24-1 L/D extruder and support equipment capable of processing over 100 pounds of material per hour. Despite the relatively heavy weight of the extrusion system and head, which are both mounted on and move with the machine, the machine generates impressive performance with high acceleration rates and high feed rate capability. This is an ongoing research and development program and Thermwood Management cannot say when commercial systems might be available to the market, but they believe this technology represents a major opportunity and that “Additive Manufacturing” will become a significant factor in the future of manufacturing. Thermwood believes it is in a unique position to pursue this emerging technology since, at one time, it was a plastic processing company that operated large plastic extruders in a production environment. Thermwood is already a major manufacturer of the “Subtractive” machinery part of the equation and this same technology is the basis of the “Additive” equipment. Thermwood also designs, builds and programs its own sophisticated CNC controls which it can tailor to any new requirements and also has experience developing sophisticated design and CAD/CAM software packages which are also an important part of this new technology.